"Just a short note to let you know that your honey is absolutely great!! Brings back memories of my grandpa with his bees. The taste is really good! Will always buy this from now on." "I love everything about your honey. The flavor is exquisite (light and a slightly fruity note, but not light in a way that doesn’t flavor fully or sweeten fully), and the texture and crystallization are awesome. I picked up an 8-oz. bottle of your honey, and it was gone within 5 days — and I was the only one using it!" "I want to let you know how much our family enjoys your Gentle Breeze Honey. Thank you for your efforts and wonderful honey." "I saw an article about Gentle Breeze Honey several weeks ago and decided to buy some. It is wonderful! Like liquid sunshine. I’d always shopped based on price alone before, figuring all honey available in the store was the same. Yours is very different and worth every cent. I will happily include your honey in our holiday baskets for both local family and those out of state. It warms my heart to know there are people who actually care about the bees – their health, sustainability, and future – in the midst of all the bad news I’ve read about their nationwide plight. And how exciting to have that knowledge and experience right here in Wisconsin. Thanks for a great product, and for going about it the right way. You rock." "Your honey comes off the spoon in circles. This is an old health store trick to confirm that the honey is raw. Yours makes beautiful circles every jar!" 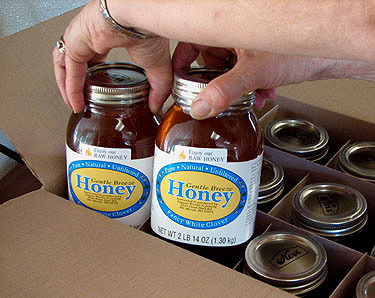 "Gentle Breeze Honey is, without a doubt, the best honey I have ever eaten." "I’m a first-year grad student at Northwestern University, and I just had to write you and thank you for making such fantastic honey. Your heavenly honey is the only thing that can get me out of bed all of these early mornings! I hope you realize how much all of your hard work is appreciated, and that you bring happiness to more people than you know!" "Just had some of your honey and it took me back to when we had our own beehives, about 40 years ago. I have not had that kind of wonderful-tasting honey until I picked yours off the shelf at our local grocery store. It took me back to the wonderful taste of REAL unfiltered white clover honey. I am sooo happy to have found it! Someday I hope to take a ride to Mt. Horeb and visit your honey farm! Until then may God bless your family and thank you so much for all your effort and hard work to bring that wonderful-tasting honey to us!"